Time to update the City of Raleigh flag? Leo Suarez of the Raleigh Connoisseur has some similar thoughts on Raleigh’s flag that I’ve had. I think the time might be ripe to update the city flag and get something we can all be proud to fly! 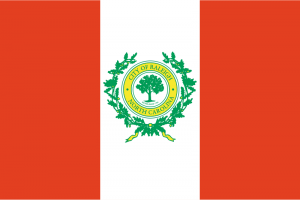 via The Raleigh Connoisseur (April 25, 2012) – The City of Raleigh Flag. maybe because it doesn’t really matter?! ?